A third seed in the playoffs for the Union will pit them against MLS’ hottest team. A nice piece on assistant B.J. Callahan, the Union’s hardest-working employee. Ray Gaddis is up for MLS’ Humanitarian of the Year award. Ghanian news picks up on David Accam’s season-ending surgery. Drexel takes on Princeton tonight in University City. Inter Miami is looking at a former landfill for their training facility. The league’s awards ballots are out! Check ’em here. MLS also announced SuperDraft and combine days and locations for 2019. It’s musical chairs in Austin and Columbus, while reports say that MLS in Austin is a matter of when not if. With just two weeks left in the regular season, what’s in store for Week 34? Megan Rapinoe continues to be my favorite outspoken soccer player and says FIFA doesn’t care about women’s soccer. A rundown of USWNT players who could see World Cup breakouts in France in 2019. What to expect in tonight’s USMNT friendly versus Peru. Trusty isn’t eligible for rookie of the year? Nope. He signed with the Union in 2016 though only played for the Steel until this season. Thanks. I get that he was on the roster, but seems ridiculous since he never even played a game for the union. Nice to see him in the mix among the top defenders though. 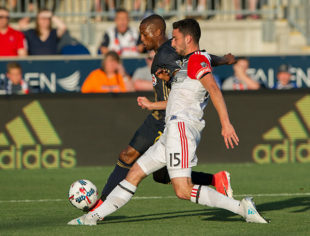 If DC stays hot they could grab the 5th seed, and if they do that likely means they beat NYCFC Sunday, which would help the Union in their quest to get the 3rd seed. I would much rather have the 3rd seed and face the Red Bulls in the 2nd round then deal with Atlanta. DC is red hot because it seems like they haven’t left Audi Field since August, and after a really busy late-season schedule back-loaded with home games, they end on the road in Chicago and will then travel for the Wild-card game – are they really a threat in that scenario? So worst case scenario is the Union and Columbus both collapse and Union have to go to Audi field (or just Union collapse and have to go to Yankee Stadium twice in a week). And to think games at the end of the season don’t matter without pro/rel. Also it looks like a winning record will be required to get into the playoffs this year and hopefully as the league expands the playoff field doesn’t. Twitter is filled with rumours of the USMNT lineup having some drastic changes for tonight’s game….could Fafa get the start? Hope he does and that we won’t see Bradley! ….they called in Keaton Parks?